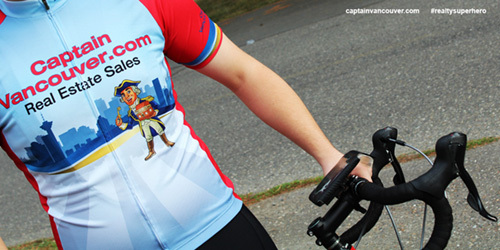 #Vancouver cycles from Sea to Sky. 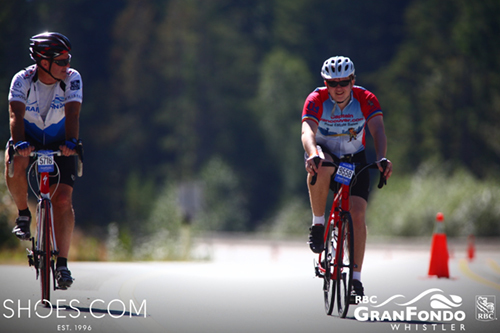 The GranFondo this year started in Stanley Park at sea level and cyclists rode 122 km all the way up to the village of Whistler an elevation of 1700 meters. Since we proudly sponsored a rider this year, Septembers blog is going to be about Whistler and what it is like to live there. 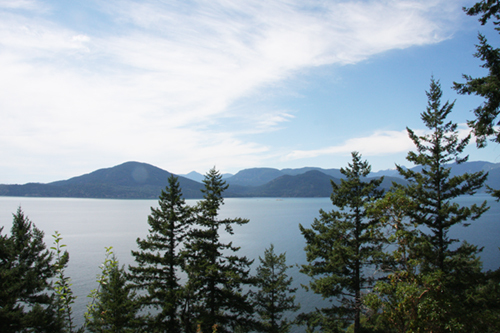 Whistler is approximately a 2 hour drive north of Vancouver on the Sea to Sky Highway. Enjoy the incredible ocean views as you drive, and by the way I have an island or two to sell you if you looking along the way. (VancouverIslands.ca) Now if you are one of those fast riders…I mean the Grand Fondo cyclists, apparently it only took some of them 3 hours and 15 minutes to get from Vancouver to Whistler…yes some of them actually drive their bikes as fast as a car It’s really quite exhausting to watch them pass my car! Whatever your mode of transportation though, be it train, car or bike, the biggest pit stop after Horseshoe Bay is a place called Squamish, (Sḵwx̱wú7mesh) known as the Outdoor Recreation Capital of Canada. 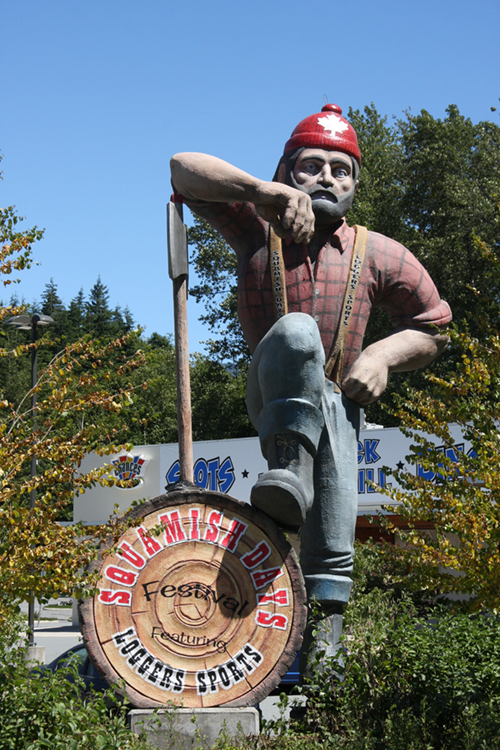 Here you will be greeted by roadside attraction 'Sam' the Axe Man, a throwback to the 2010 Olympics. Sam has had a recent facelift in 2014 including a new hat so what you see in the photo below is a little different. Now from a Real Estate perspective, Squamish is definitely an attractive place for first time homebuyers looking to get into the market, but who maybe can't afford the prices in Vancouver. You'll likely commute, but the prices are comparable to Maple Ridge so it will be well worth it to move there for those wanting to break into the market. Squamish has come into its own over the last couple of years.Its no longer thought of as the pit stop on the way to Whistler. Its become a destination city in its own right with the Squamish Valley music festival, the Sea to Sky Gondola and a lot of attractive activities for the outdoorsy type. 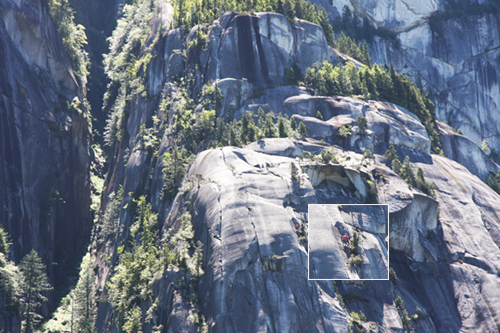 Check out Explore Squamish and make sure that when your there...take a peak up at the peak of the Stawamus Chief Mountain. Look closely and you'll no doubt see mountain climbers on the various edges of the mountain.Can you see all the hikers in the photo below? I've highlighted one but there is way more if you look closely! On from Squamish heading north, you'll travel 58 kilometres, or a little more than 40 minutes to get to Whistler where you will be met by another roadside attraction at the very entrance to the town, an Inukshuk which traditionally means "You on the right path". 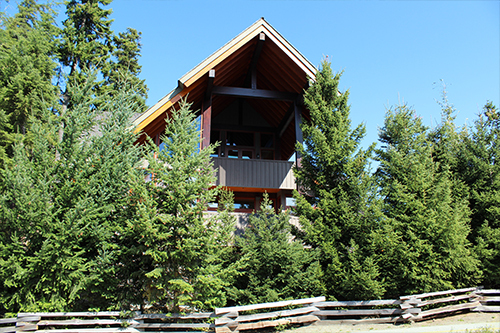 You will definitely find that you are indeed on the right path when you spend any amount of time in Whistler Village and the surrounding area. 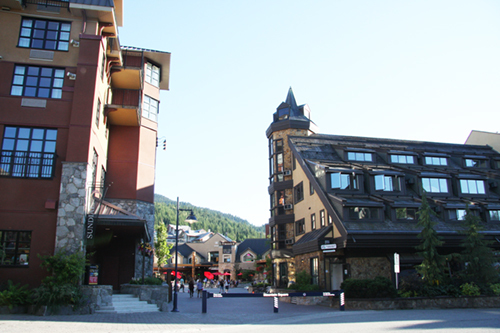 Whistler is considered a resort town and since the Winter Olympics of 2010, it has attracted international attention. From a Real Estate perspective, historically Whistler has attracted investors looking to invest and buy second homes. From 2008 to 2014 prices have gone down drastically and today it is half the value it was at it peak in 2008 - perhaps a good time to buy! Check out the HPI price to get a sense of the market over the past 10 years. If your planning on working in Whistler, and price is a concern, then you should look at the Whistler Housing Authority where you will be able to get the run down on affordable housing and ownership housing options for people who need to work and live there as opposed to real estate buyers looking to invest. There is a trade off when you live in a place like Whistler. You are trading the noise, pollution, and busyness of the city for the quite solitude of the wilderness at the expense of convenience, amenities, and in the case of resort towns like Whistler, over two million visitors a year. It's a lifestyle decision to live there but it seems worth it to me when you experience the beauty of the area plus the homes have a certain alpine look to them which I personally like. I’ve mentioned before that my wife is in film and she usually likes to get some b-roll footage here and there when she can. So this time when we went to meet our cyclist in Whistler, she wanted to drive way up the mountain, as far as we could go, in order to take some shots of Whistler Village from the top. So we drove as far as our car would take us where there were a few chalets, row of town homes, a gondola station, plenty of tree and mountain tops as far as the eye can see. There were also lots of people on the chair lifts riding to the top overhead to go hiking or mountain biking. My wife and our cyclist positioned themselves looking downward toward the village, underneath the chair lifts where there is a lot of low grass. Our rider held the tripod while my wife filmed (I sat in the car which was smart as you will soon find out). As my wife was blissfully filming away when she started to get waves, heckles, pointing and this strange sort of puzzled look that many of them were giving her as they passed overhead. She ignored it but it kept happening. One chair list rider after another …this is strange she thought...why do they looked so puzzled at me she asked. So she turned too looked to our cyclist to tell him…. "don't worry, just ignore them…. everyone wants to be a movie star” Only now our cyclist was suddenly a sprinter…sprinting with the tripod pointing in an awkward position sideways and backwards, while he ran in the opposite direction of my wife back to our car. Keep in mind he had just ridden 122 kilometers…then ask yourself what would make a person sprint after that! My wife looked back up at the chair life…"are they trying to tell me something….I need my glasses….and I should take out my headsets too so I can hear exactly what they are saying," my wife said to herself. 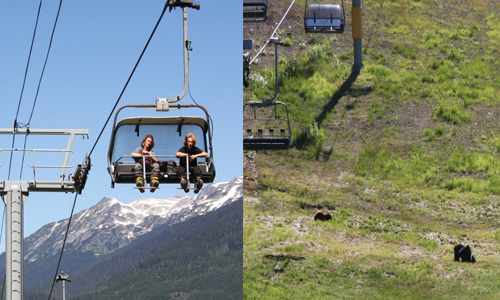 That is when she realized that the people on the chair lift were not star struck or annoyed by the presence of her camera filming them…it was a family of three black bears eating right behind her. They were either shocked or trying to warn her. My wife says there was a moment of sheer panic and physical freezing, that is until she scanned her eyes over to the right a bit where there was a young boy who was around 10 sitting on his bike (those bike people are a tough bunch) where he was standing even closer to the bears than my wife. He waited in an almost nonchalant manner, leaning his elbow down on the bike handles as if to say ‘hurry up’.The bears were eating close to the path, but after a minute or two they moved off the path and then he ever so casually drove his bike past them at what my wife describes as a leisurely pace. I could only image this boy texting his mom to say that he would be late because some bears were on the bike path. Not quite the same as what a kid in the city has to worry about.